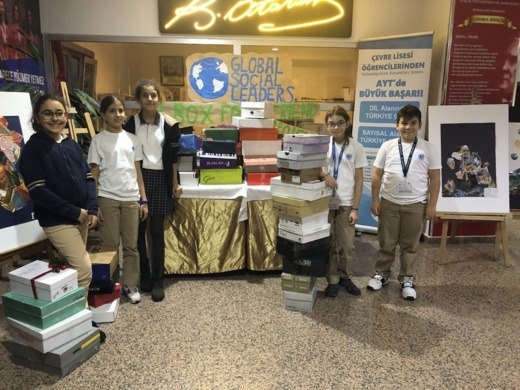 We are delighted to share a blog written by the Begum Cetinkaya, a student at Cevre College who is part of a team delivering a Global Goals project for the 2018-19 Global Goals Competition. Poverty and education are two global issues and although in Turkey and in many parts of the world people have developed ways to prevent poverty and provide better education, these two subjects together are very dangerous tools against society itself. Safe in the knowledge that our school has already been successfully involved in social projects that focused on helping students with disadvantaged backgrounds, our project this year is built upon 3 goals: “No Poverty”, “Quality education” and “Eliminating the Inequalities”. This year we, a group of mixed students from 5th, 6th grades and highschool decided to try to change the world for the better through social action and personal development. Supported by our school board and all our teachers and friends, we started working on a project called “A Box For A Friend”. 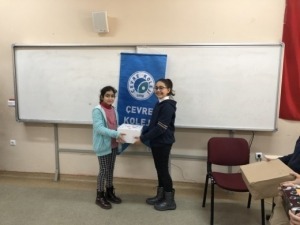 We chose the objective of this year’s project to be based on poverty and to try to make a difference in the lives of children from disadvantaged areas of East of Turkey. At the same time, we aim to raise awareness, create a connection between schools and students, and to improve the quality of life and education of students in these areas. Unfortunately there are many schools that have students with serious needs. Everything from pencils and papers to help with clothes and even food. However we could only choose one school which is in Kahramanmaraş. We have discussed with the school management from that school and identified their most urgent needs. Based on their information we concluded that the boxes should contain: clothing, school supplies, used books, and a short heartwarming letter from the student to the receiver. We introduced the project to the students and families from our school and were overwhelmed by the wonderful response and support that we have received from them. 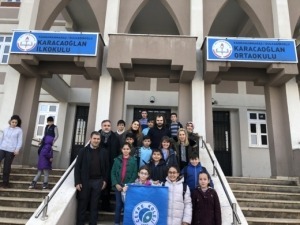 After we collected more than 200 boxes , we sent them to Karacaoglan Primary and Middle School, Kahramanmaraş by cargo and together with 2 teachers we travelled to the school to meet the headmaster and students personally. It was overwhelming to see the gratitude in their eyes and we came back to Istanbul with the desire to continue helping them and other schools. After completing the first part of our project we became more determined to help and give support to children in need. Therefore, we are planning to continue our work by building up the network of contacts that we’ve built up during the process. We also work on developing new ways of contributing to these communities in the close future. We have learnt about ourselves that when we are faced with obstacles we can overcome them. During the process we learned to be better organizers and to collaborate with each other, to make quick and accurate decisions sometimes under pressure. The biggest challenge at the moment is to keep the interest of our supporters alive. Since the boxes have been donated we want people to realize that the project is still ongoing. We are on our way to continue our project by collecting more boxes around International Children’s Day (23rd April). We are also planning to raise financial funds by auctioning art work and hand made items created by students of our school. We will also sell food items, movie tickets and organize a Talent Night. With the funds raised we would like to organize the next steps of our project and we would like to shout out loud that people need people! We should all go hand in hand in this community project and the more people join the group the better. This project is not about a place or resources, it is about people helping people without limits and constrictions.